What Size Should My Triangle Be? 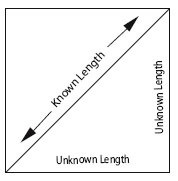 Situation 1 – When you know the finished length of the long side of a triangle, multiply that number by .707 to get the length of the short sides. Then, add 7/8″ (0.875) to each side for seam allowances. Example: I want a triangle where the long side, when sewn, will measure 2″. 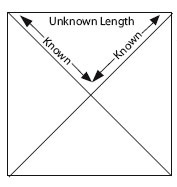 I will cut a square 2.29 inches on each side, and cut it diagonally IN ONE DIRECTION to make triangles that, when sewn, will measure 2 inches on the long side. Situation 2 – When you know the finished length of the short side of the triangle, multiply that number by 1.414 to get the length of the long sides. Then, add 1-1/4″ (1.25) to each side for seam allowances. Example: I want a triangle where each short side, when sewn, will measure 2″. I will cut a square 4.08 inches on each side, and cut it diagonally in BOTH DIRECTIONS to make triangles that, when sewn, will measure 2 inches on each side.